Click here for the full KZSU playlist for Tuesday, October 6, 6:00 a.m. to 9:00 a.m. So, in two weeks of doing my new Tuesday slot, I’ve found another disadvantage: I can’t find time to write up these playlist notes! Small price to pay. I’m relishing the quietude of the morning studio and the immense acres of available parking. After years of dealing with Friday afternoon crowds, it’s the promised land! 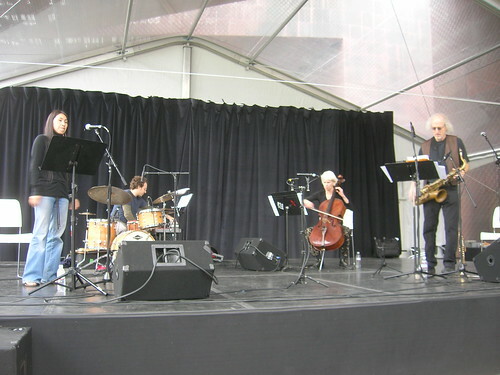 … Yet another quartet from the rich Chicago free-jazz community, this time focusing on 1950s influences, primarily Jimmy Giuffre. 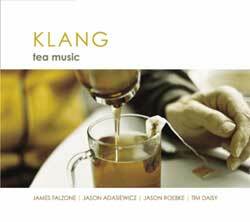 Klang uses a vibraphone to produce a lightly upbeat sound that’s catchy but still adventurous. It’s got a sound to go with the album’s placid coffeehouse cover. … Pitting throat singing with electronics. Tur is no stranger to this kind of idea, having recorded with Ry Cooder and with the Kronos Quartet. This time, the pairing results in some very nice drones. 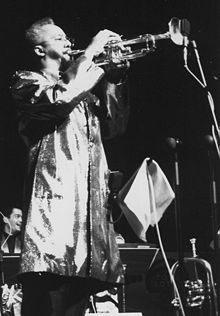 … There was an all-star Lester Bowie tribute happening Friday (the 9th) in SF, so I took the opportunity to bring some Lester out of the vinyl collection. All the Magic (1982) is a two-album set dedicated to his mother, who’d passed away recently, and the gatefold includes pictures of Lester with school bands (formidable marching bands in uniforms, serious stuff) and of his family. It’s also got a really good photo of modern-day Lester leading one of his big bands. The first album consists of Lester and a band, so I played one track from there. The second album is all Lester, doing solo trumpet with overdubs, so I wanted to spin one of those, too. I picked the track “Okra Influence,” because … well come on, it’s called OKRA INFLUENCE! The tribute was something to behold, I’m sure. Roscoe Mitchell and Famadou Don Moye from the original Art Ensemble; Corey Wilkes, the guest musician who’s been Lester’s de facto successor; and Fred Ho, making a rare West Coast appearance. For old time’s sake, have a listen to an old Fresh Air interview with Lester. I love that Steuart Liebig has a bar band. The Mentones not only stomp through some rocking beats, they also pair up the saxophone with a chromatic harmonica, one that gets played like an electric instrument. It’s a buzzing, flailing, bluesy good time. But under the surface, the band is playing the same kind of complex chamber-jazz music that Liebig uses on his more “serious” albums. Pomegranate, one of those “serious” albums, was my introduction to Liebig. He’s part of the southern California crowd that includes Vinny Golia, G.E. Stinson, Nels Cline — and Jeff Kaiser, the guy who’s kept the scene documented for the past decade on the pfMentum label. each featuring a different guest soloist. I love the mix of cerebral jazz and thoughtful composing here — especially on the Nels Cline track, which ditches all chamber-jazz pretentions and goes for a total noise freak-out. Yeah! But back to that bar band, The Mentones. This is fun stuff that evokes images of dive bars just outside town, where the motorcycles kick up the desert dust. But with sheet music. Bill Barrett‘s harmonica adds a honky-tonk touch to otherwise chamber jazz-y compositions, and then he blazes through his solos like he’s ready to throw beer bottles back at someone. A track like “Empty” or “Locustland” manages to rock out amid complex twists and turns in the writing. “Headlock” is a great head-banger. “Wool” and “Slow Burn Fever” go for the slower, swampy tempo of a dusty 110-degree day, although the latter ends up in a brutal battle of harmonica versus Tony Atherton’s sax. This is the third Mentones album, after Locustland and Nowhere Calling, and I’d recommend any of the three. * Also in NYC on Oct. 13, performing at Roulette. Drumming Core puts Larry Ochs‘ sax in the middle, flanked by drummers: Donald Robinson on one side and Scott Amendola on the other. It’s not a unique setup (see Ken Vandermark and Sound in Action), but it’s compelling, and Ochs has gotten good mileage out of it. While Stone Shift is the third Drumming Core album in seven years — a decent track record for avant-garde groups — tours and shows for the group have been sporadic, probably a byproduct of busy schedules and the usual economic handicaps. Based on Ochs compositions, Drumming Core pieces have a songlike feel. The drums get plenty of freedom, but for long stretches, they’re also responsible for keeping an overt rhythm to the pieces, creating an interweaving of rhythms and soloing that doesn’t get overwhelming. In live shows, it’s a treat watching the contrast between Robinson and Amendola. Both play all kinds of styles, of course, but each has trademark moves that are particularly satisfying — Amendola’s traces of funk in the beat, Robinson’s deliciously intricate mallet work on the toms. Their styles overlap quite a bit, too, but the differences make a live Drumming Core show really percolate. For the past couple of years, Drumming Core has added the team of Satoko Fujii (piano) and Natsuki Tamura (trumpet), who appear on Stone Shift. The result opens up more possibilities for interplay and new sounds, of course. I really enjoyed the dry, stripped-down feel of the original trio, but I also can’t blame Ochs for wanting to explore new territory with the band and the compositions. Stone Shift is a good listen, built of four extended pieces that make good use of all the band’s talents. “Across from Over” opens in a swingy, thumpy vein, Ochs buzzing on tenor sax with the drummers playing rhythms that could have fit a blues jam. After a few minutes, the trumpet makes its entrance — but then, everything condenses into a quiet improv, pocked with tiny blips of organ-sounding synth. The final minutes get into an exciting rhythmic pulse, with heavy-handed piano and ecstatic trumpet blares over a deep drumbeat. It shows how the extra two instrument can kick up the level of drama. “Abstraction Rising” shows off the compositional nature of Drumming Core, in the form of unison sax/trumpet lines, a sound that draws from the late ’60s well. The track puts Fujii’s piano up front right away, a combination of abstract splashing and ocean-deep middle-register phrases. As the sound settles down, the trumpet and sax play out a unison jazz line that draws from the ’60s well. After some brisk group improv, another composed line surfaces from a pulverizing sea of low-register piano (a Fujii trademark). The quiet opening to “Stone Shift” shows off the subtle possibilities of the drums, including an especially tight, soft roll that could be either drummer but conjures up Robinson in my mind. I have to admit, Fujii’s use of synthesizer on here is weird and sometimes distracting, like a gimmick. You could call that a bias on my part — here’s a new sound that my ears don’t associate with this type of music, or at least with this band, so it’s getting rejected like an organ transplant. Could be. Or maybe, just as the bagpipes or piccolo wouldn’t sound right in certain settings, the synth isn’t what’s needed here. At any rate, she uses it sparingly, and sometimes to good effect — a bubbling low-register synth backing serves well against an energetic Ochs solo on “Stone Shift,” like a menacing lava pool just under the surface. And near the end of the piece, there’s a sparse phase of muted trumpet and tiny sax sounds — it reminds me of parts of Cecil Taylor’s Unit Structures — with light synth that acts as a background curtain. All told, this is a solid album. Catch this group while you can. Like Finn passing all those planets, they don’t come around as often as you’d like. By the way, a word about Kihnoua, which will be performing at the Oct. 4. show. 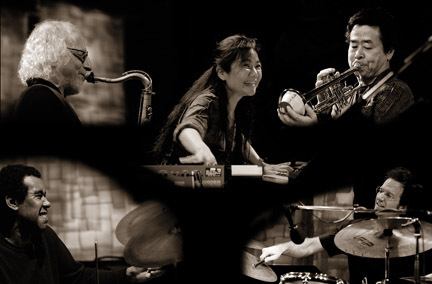 It’s an improvisatory group that includes Amendola, vocalist Dohee Lee, and various guests: Okkyung Lee or Joan Jeanreneaud (cello) in the permutations I’ve seen; Fred Frith (guitar) or Liz Allbee (trumpet) on the Oct. 4 show. I wrote up a brief review of a performance last year, and Ochs is aiming for a CD release in the spring. KZSU playlist for Tuesday, Sept 29, 6:00 a.m. to 9:00 a.m.
A new era! Actually, no — I might go back to my Friday time slot within months. Call it a mini-era. Either way, I’ve migrated back to my early-morning roots to kick off the station’s new fall-quarter schedule. Because we’re often off the air during the 5:00 a.m. hour, I’ll start most of these shows with a long track — 10 minutes minimum, 20 minutes preferred. I figure by the end of that, I’ll have three or maybe even five listeners out there for my first microphone break. Hey, a guy can dream, can’t he? Tim Berne started his new/current era of self-publishing with the 3-CD Bloodcount Unwound set, so I used that as my starting point. “Loose Ends” is a 13-minute piece that opens with a catchy blaring of horns that drops into a tough-grooving bassline. Good way to get the blood pumping. I think I’ve said that before. Unwound was indeed the first release on Berne’s Screwgun label, which started before Internet promotion was commonplace. I happened to see a show of his just before he launched, where he told me the whole plan and pre-sold me a copy. I like to think I was one of the first people to receive Unwound in the mail. Anyway, click here to see the full playlist.